The Sedins don’t want to play anywhere else. The Canucks have said they don’t want to trade them. It looks like they’ll stay put with the Canucks until the end of what should be a pair of Hall of Fame careers. 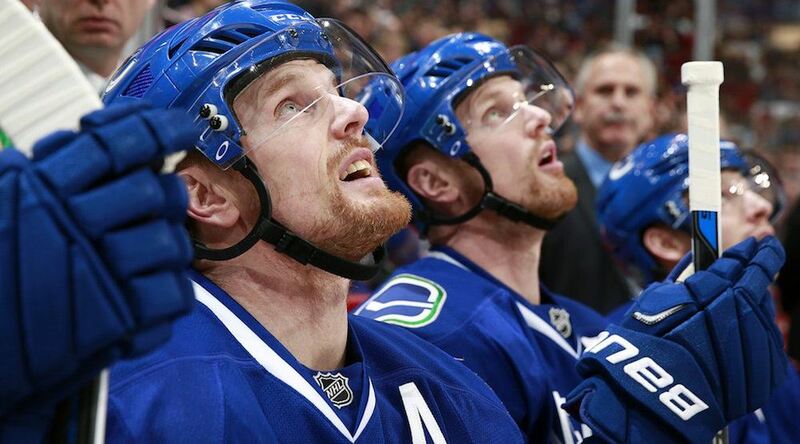 Imagining Henrik and Daniel Sedin in any other uniform is hard to do. But as they enter the last year of their contracts with no talks of a contract extension yet, you have to wonder if they’re making the right decision announced in a tear-inducing Players’ Tribune article. For them, and the team. There’s no discussion if you allow emotion to be included in this. No players in the 47-year history of the team have done what the Sedins have done. Henrik ranks first in points and assists, while Daniel is the franchise’s all-time leading goal scorer. Henrik is the only Canucks player to score over a thousand points with Vancouver, and Daniel will become the second. They deserve to go out on top. They should stay with the only team they’ve ever known. Right? The other side of the argument is that the Sedins should move on. If you take emotion out of the equation, there’s a sensible argument to be made. If this is the last season of the Sedins’ career, does it really matter if they finish it in Vancouver? As complicated as a potential trade would be, they could fetch a return of prospects and draft picks at the trade deadline, despite their matching $7 million contracts. While that may be a tough pill to swallow, it could help the rebuilding Canucks. Consider that trading Trevor Linden – the most popular player in franchise history – was one of the best moves the franchise ever made (don’t tell Mike Keenan that). Linden fetched a return of Todd Bertuzzi, Bryan McCabe, and a draft pick used to take Jarkko Ruutu. Bertuzzi and McCabe eventually helped bring a Sedin and Roberto Luongo to Vancouver. Watching the Sedins try to win a Stanley Cup – provided it’s not with the Leafs, Bruins or any other stomach-turning team – would be something a lot of Canucks fans would get on board with, assuming Vancouver is out of contention. Alex Burrows turned Vancouver into a Senators bandwagon town for a few weeks, and that would be tenfold if Henrik and Daniel were making a push for the Cup. If the Sedins do want to return for another season, there’s a case to be made that they would be standing in the way of the team’s young players to develop as leaders. It wasn’t until Markus Naslund and Trevor Linden left town in 2008 that it truly became the Sedins’ team. The Sedins were ready to break out at that time though. Can the same be said about Horvat and the likes of Brock Boeser, Sven Baertschi, Troy Stecher, and Ben Hutton? Or are the Sedins more valuable as veteran leaders, showing the next generation the way forward? Everyone would love to see the Sedins retire after lifting the Stanley Cup above their heads in a blue and green jersey at Rogers Arena. But unless they’re the second coming of Jaromir Jagr and play until their mid-40s, that’s not very likely. So what’s the next best thing?